Martine Saunier was born in Paris. Although she lived and attended school there, she spent every summer vacation at her aunt’s home in Prissé, near Mâcon. Her aunt owned a winery with approximately 10 acres of vineyards planted with Chardonnay and Pinot Noir. The winemaker lived in the farm next door with his wife and children. The pinnacle of the summer vacation was the harvest time. By the age of 10, Martine was fascinated with the preparation of the cellar, the wine press, the fermenting vats and, of course, being part of the harvesting team. The crushing of the grapes, malolactic fermentation, bottling, etc. were all part of her childhood. 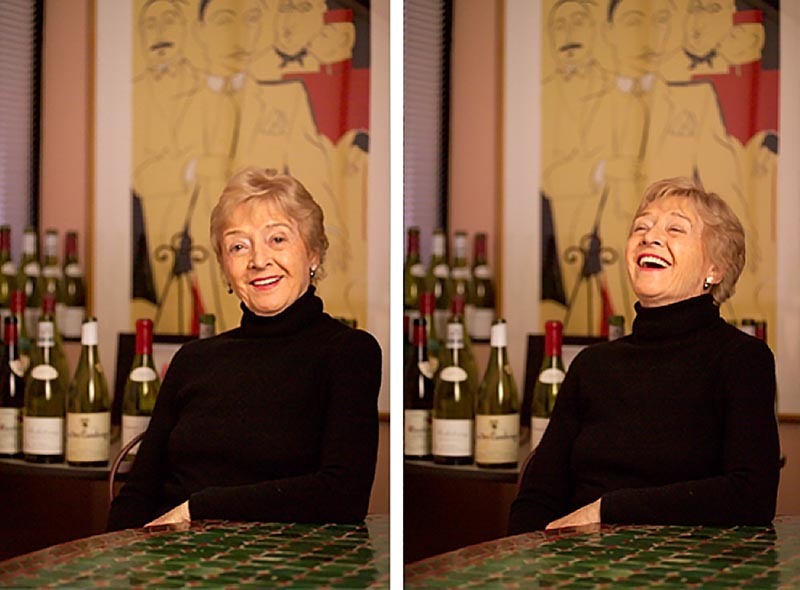 When Martine moved to the United States in 1964, she started to look for some local California wines. In 1965, she drove to Beaulieu Vineyards, knocked on the door and was lucky enough to meet the great André Tchelistcheff. He told her in his good French that if she wanted good Pinot Noir, she had to go to Burgundy to get it! The seed was planted in her mind. A few years later, Martine was offered the job of selecting wines for an importer/distributor in San Francisco. Still dismayed by the absence of many of her favorite wines, she started making buying trips to France. In the spring of 1969, she flew to Burgundy, bought a small VW bug, and started her tour and career. At first, she kept close to familiar sources, namely Beaujolais, Mâcon and Pouilly-Fuissé, but eventually she ventured into the Côtes-du-Rhône on the lookout for some Châteauneuf-du-Pape. Undaunted, she created a mailing list of friends and associates, and sent out her first price list and wine descriptions. The wines sold rapidly, and for five years she remained the company’s special-selection wine buyer. She was traveling to France every year, and she discovered and stocked some extraordinary wines. In 1979, Martine incorporated her business and made it official: Martine’s Wines was born! Martine is a member of Les Dames d’Escoffier and was formerly on the national board of AIWF. She is also a Chevalier du Tastevin. In addition, she has been decorated twice by the French government with the title of Officier du Mérite Agricole. In December 2012 — 33 years after founding her company — she passed the torch to a new generation of owners. “I wanted to leave my legacy to someone who would take care of it. I thought, ‘It has to be a Frenchman,’” Martine says. During a meal at her home, she and Gregory Castells, a Provence native and renowned wine expert, realized they were a perfect fit. They struck a deal, and today, Gregory leads the company, with Martine remaining on board to ensure the valued relationships she forged over so many years endure through the transition and beyond. Martine also continues her new career as a film star and producer. Her first documentary, A Year in Burgundy, which tracks several of her top winemakers through a year in the lifecycle of their vineyards, was released in 2013. She is currently working on two more films, about the wines and producers of Champagne and Portugal, due out in 2014.